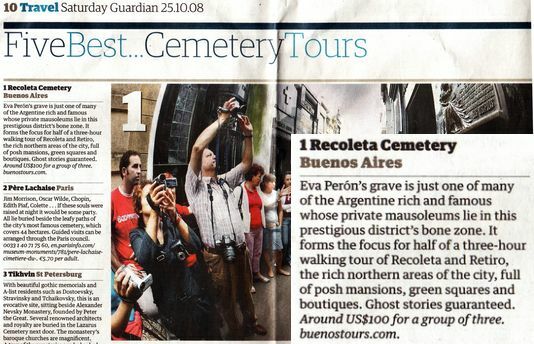 This weekend BuenosTours was recommend by the Guardian newspaper (one of the UK’s most widely read dailies) in their article on The Five Best Cemetery Tours, in which they listed BuenosTours and our tour of Recoleta Cemetery (plus surrounding areas) first – I guess making us the best cemetery tour in the world! If you want to book the “best cemetery tour in the world” with us, click here for more information. The cemetery part of the Recoleta tour is also included in our private day tour of Buenos Aires. You can listen to the episode here: For Whatever Reason on BuenosTours (the part about Buenos Aires and BuenosTours starts at about 16 minutes in). Finally, you can click here to book the private guided city center walking tour they took!